OASIS. Davao City Peoples Park is a patch of green in the bustling metropolis. Davao City is huge metropolis and when the heat of the concrete jungle gets too much for comfort, it’s good to know that there’s a sanctuary just waiting to be sought. Aside from the air-conditioned comfort of malls and restaurants, Davao City has Peoples Park to provide a space to breathe without having to spend a centavo. Davao City Peoples Park is a sprawling complex with shaded sitting areas, refreshing (man-made) landscapes, a 1000-meter jogging path and lots of plants. The park is located at the heart of the city, surrounded by towering buildings, hotels and commercial centers. It is an oasis in the middle of the pulsating desert that is downtown Davao. The site where Davao City Peoples Park now stands used to be a multipurpose grounds where sporting events, annual trade fairs and occasional concerts where held. The area was called PTA Grounds then, the haunt of budding local athletes running endless laps in the oval, swimming in the pool, or playing a game of soccer. PTA Grounds also played host to numerous inter-regional affairs and I can vividly remember dancing as a cheerleader for our high school in one of them. 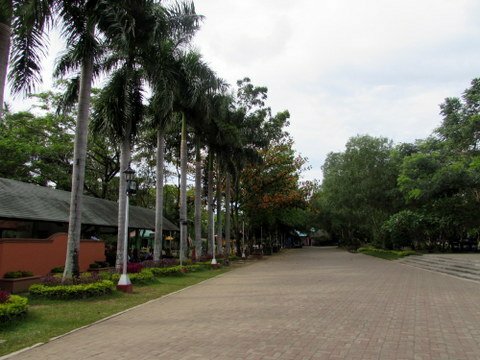 In 2007, the PTA Grounds was converted into a P72M park for the locals of Davao City. The once barren piece of land was transformed into patch of green in the middle of the city. Think NYC’s Central Park, only in a much much much smaller scale. 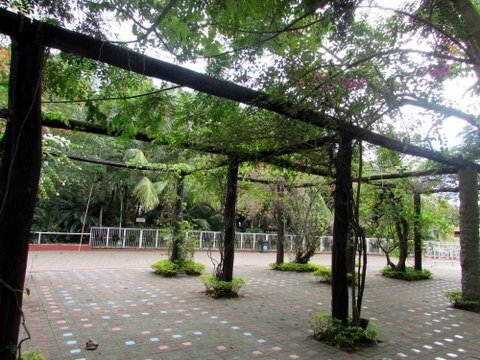 The park was named through a contest, the winner of which won P50,000. Davao City Peoples Park was officially inaugurated by Mayor Rodrigo Duterte on December 15, 2007. 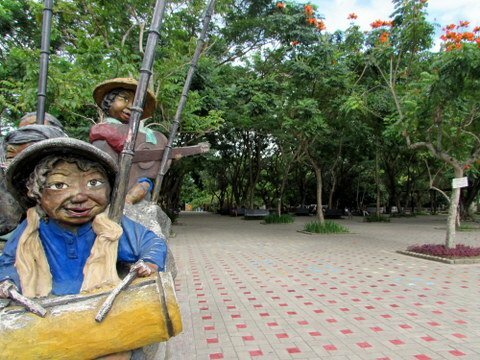 Davao City Peoples Park has pocket forests, man-made waterfalls and ponds, a children’s playground, a brick-laden jogging path and a visitor’s center, among others. 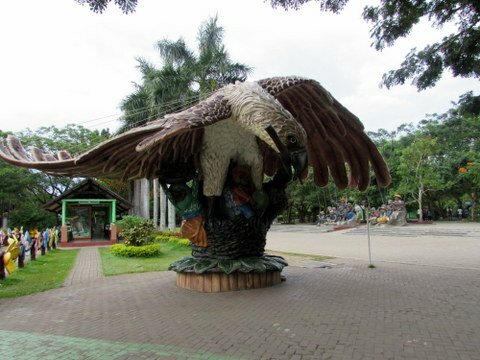 Visitors are welcomed by a gigantic sculpture of the Philippine Eagle, one of the city’s symbols. 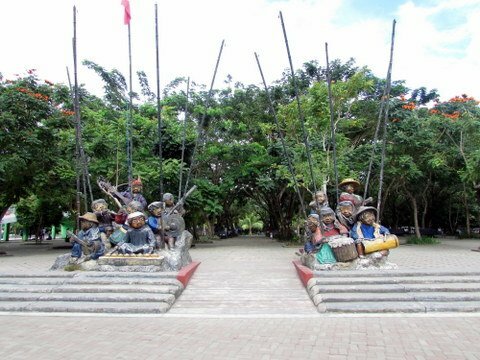 The sculpture, as well as all others situated all over the park, is the work of famous Mindanao artist Kublai Millan. PROTECTIVE. The King of Birds seems to be guarding over his lair close to the entrance to the park. The oval race track from the old PTA Grounds was retained and transformed into a beautiful path laden with bricks now called The Promenade. Local health enthusiasts jog and so all sorts of fitness routines in this path that circles are entire complex. FRESH. 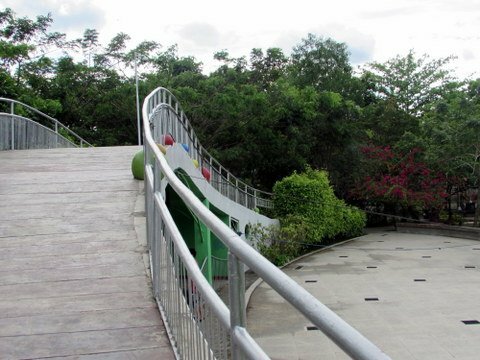 The tree-lined jogging track called the Promenade circles the park. Inside the Promenade is a plaza with benches sitting under the shade of African tulips. It’s a fine place to rest one’s feet after hours of sightseeing in the city. Pigeons provide laid-back entertainment, often chased by curious children. PUT YOUR FEET UP. The shaded plaza provides the perfect spot to relax and people-watch, with benches sitting under the trees. STUNNING. This vine-laced pergola on the left side of the plaza makes for a serene backdrop for photo sessions. Close to the plaza is a bridge looking out into the park’s dancing fountain, the first of its kind in the city. Though the fountain is not on all the time, the sculptures of different tribal people still provide an excellent backdrop for photos. SOUGHT-AFTER. Standing space on this bridge is most coveted during special events and concerts held in the park. TRIBES. 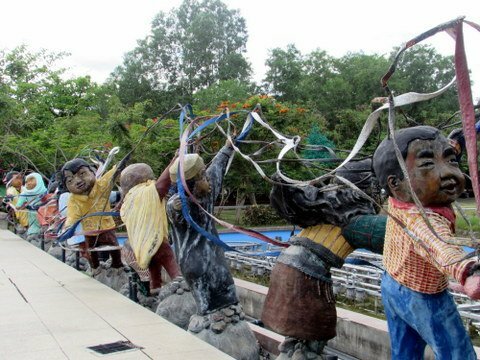 The local tribes of Davao City and surrounding towns/provinces are represented in this row of sculptures. 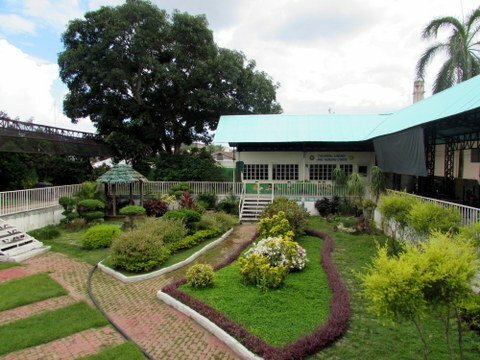 Davao City Peoples Park also features a sunken garden, a remnant of the old swimming pool where athletes used to practice in. The hollow area was converted into a zen-inspired garden with a bridge in the middle. Close to the sunken garden is a children’s library and a pond where numerous koi fish thrive. ZEN. The park’s sunken garden exudes an air of tranquility. The Durian Dome is where the Visitor’s Center is located. Visitors can actually go up a flight of stairs to the dome which spikes reminiscent of the durian fruit for which Davao City is famous. The dome is located close to the park’s entrance/exit gates. REGAL. 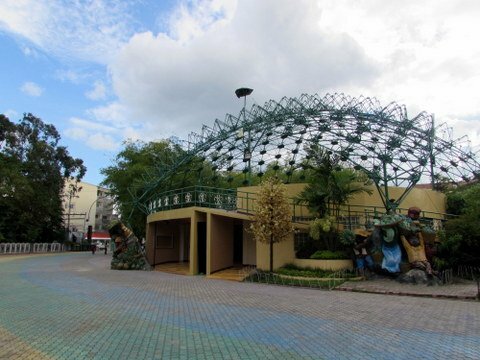 The dome reminiscent of the King of Fruits, durian, houses the park’s Visitor’s Center. Other attractions in the park include a 10-meter man-made waterfall that flows into yet another pond with koi fish. The water also goes into smaller streams and ponds scattered all over the man-made rainforest planted with bamboo and pine trees that were brought in from the Cordilleras of Luzon. Davao City Peoples Park is located at the junction of J. Palma Gil and Jose Camus Streets. 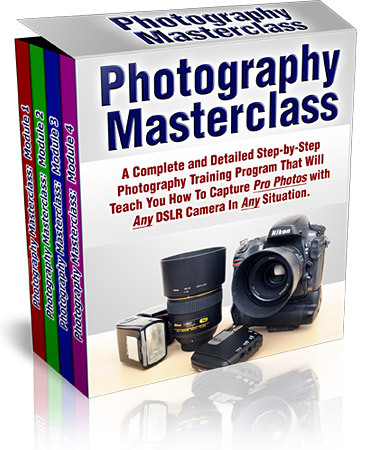 It is a few steps from a lot of hotels including Apo View Hotel, Casa Leticia, Royal Mandaya Hotel and Legaspi Suites. Davao City Hall, Gaisano South Mall and Rizal Promenade are also a walking distance from the park. You can ride a cab from anywhere in Davao City and be taken right to the park’s entrance. Or if you don’t mind a short walk, take a jeepney and just ask the driver to drop you off to the closest point to Davao City Peoples Park. Since all jeepney routes lead to downtown Davao, there’s very little chance of getting lost. If you’re ever in the city and you want a breath of fresh air without having to go too far, I suggest you go to Davao City Peoples Park. It’s a great place for resting your feet, having a snack or catching up with an old friend. Plus, the Pasalubong Center and all its local sweets and products you can take home are just a few steps away.